SEATTLE, Wash. --- Adventist evangelist Duncan Good has reported a record number of baptisms this year. He credits uncoventional, out-of-the-box thinking and an abundance of roadside puddles in his Seattle mission field for the dramatic uptick. Good has been known to drive all over Seattle for hours looking for converts. He favors one-way streets where he can easily reach pedestrians walking on either side of his car with good news. "It's all about being there for people when they are ready to make a decision for baptism," explained Good. 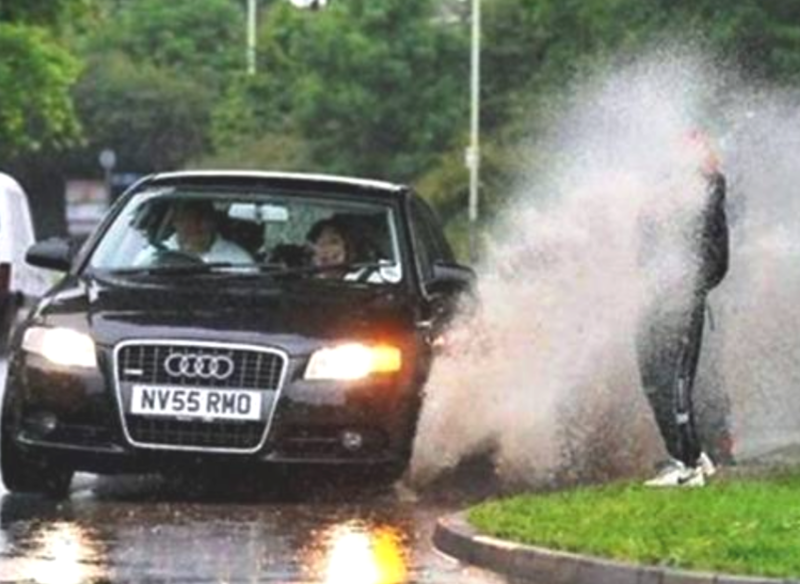 "I can always tell when someone is ready by judging how close they are to large puddles that I am driving past." As there have been what Good calls "a few misunderstandings" about his favored form of evangelism, he said he borrows a friend's car with foreign plates just in case someone tries to report him. My method always works. Drive by with the firetrucks,1-3/4 ” hose charged to 90 lbs, spray nozzle on convert. Wham-bam, done deal. Anybody wanna try it?